On October 13, 2016 the Philadelphia School Reform Commission met for its monthly Action Meeting. This is testimony of members of the Alliance for Philadelphia Public Schools at this meeting. All eight videos can be viewed here. Video of APPS member Karel Kilimnik testifying before the Philadelphia School Reform Commission hearing – October 13, 2016. Click here to read the transcript of Karel’s SRC testimony. Video of APPS member Diane Payne testifying before the Philadelphia School Reform Commission hearing – October 13, 2016. Click here to read the transcript and read relevant links of Diane’s testimony. Video of APPS member Deborah Grill testifying before the Philadelphia School Reform Commission hearing – October 13, 2016. Video of APPS member Richard Migliore testifying before the Philadelphia School Reform Commission hearing – October 13, 2016. Video of Philadelphia teacher Christine Del Rossi testifying before the Philadelphia School Reform Commission hearing – October 13, 2016. Video of Philadelphia APPS member Robin Lowry testifying before the Philadelphia School Reform Commission hearing – October 13, 2016. Click here to read the transcript of Robin’s testimony. Video of Philadelphia APPS member Richard Liuzzi testifying before the Philadelphia School Reform Commission hearing – October 13, 2016. Click here to read the transcript of Rich’s testimony. Video of Philadelphia APPS member Lynda Rubin testifying before the Philadelphia School Reform Commission hearing. – October 13, 2016. Titles of resolutions for charter renewals of Aspira, Mastery, and Universal schools were posted–but not the resolutions themselves. This is a deliberate move on the part of the SRC to make sure the public does not know what they intend to vote on. Dr. Hite was absent due to a death in the family. His Chief of Staff, Naomi Wyatt, sat in for him. On September 15, 2016 the Philadelphia School Reform Commission met for its monthly Action Meeting. All nine videos can be viewed here. Video of APPS member Karel Kilimnik testifying before the Philadelphia School Reform Commission hearing – September 15, 2016. Video of APPS member Diane Payne testifying before the Philadelphia School Reform Commission hearing – September 15, 2016. Click here to read the transcript of Diane’s testimony. Video of APPS member Lisa Haver testifying before the Philadelphia School Reform Commission hearing – September 15, 2016. Video of APPS member Rich Liuzzi testifying before the Philadelphia School Reform Commission hearing – September 15, 2016. Video of APPS member Tonya Bah testifying before the Philadelphia School Reform Commission hearing – September 15, 2016. Video of APPS member Kristin Luebbert testifying before the Philadelphia School Reform Commission hearing – September 15, 2016. Click here to read the transcript of Kristin’s testimony. Video of Bill Green attacking Philadelpia teachers which Kristen refers to in her testimony. Video of APPS member Eileen Duffey testifying before the Philadelphia School Reform Commission hearing – September 15, 2016. Video of APPS member Barbara Dowdall testifying before the Philadelphia School Reform Commission hearing – September 15, 2016. Video of APPS member Lynda Rubin testifying before the Philadelphia School Reform Commission hearing – September 15, 2016. On May 26, 2016 the Philadelphia School Reform Commission’s met to decide on non-renewal of four charters and to vote on the School District Budget for Fiscal Year 2016-2017. This is the testimony of five members of the Philadelphia Alliance for Philadelphia Public Schools to the Commission. All five videos can be viewed here. Click each picture below to view single videos. Speakers are in order of appearance at the meeting. 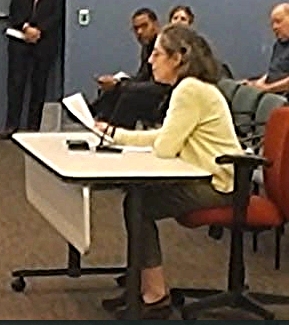 Video of APPS member Lynda Rubin testifying at the Philadelphia School Reform Commission hearing – May 26, 2016. The transcript of Lynda’s testimony. Video of APPS member Coleman Poses testifying at the Philadelphia School Reform Commission hearing – May 26, 2016. The transcript of Coleman’s testimony with a spreadsheet of relevant charter information. Video of APPS member Rich Liuzzi testifying at the Philadelphia School Reform Commission hearing – May 26, 2016. The transcript of Rich’s testimony. Video of APPS member Diane Payne testifying at the Philadelphia School Reform Commission hearing – May 26, 2016. Be sure to listen to the audio of the debate with Commissioner Jimenez at the end of Diane’s testimony. The transcript of Diane’s testimony. Video of APPS member Lisa Haver testifying at the Philadelphia School Reform Commission hearing – May 26, 2016. The transcript of Lisa’s testimony. The last few sentences were not in her testimony because of the three minute time limit.